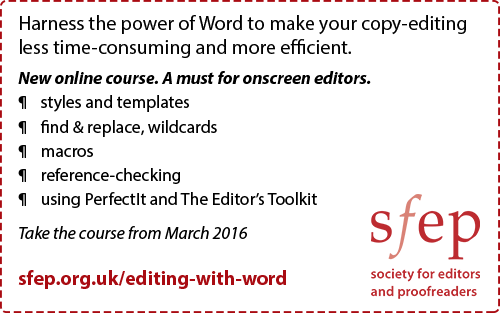 Don’t forget that we’re also setting up a private ‘Editing with Word’ forum exclusively for SfEP members who take this course. I’ll be on standby there to give a Mac user’s point of view. Is this course suitable for someone who uses Microsoft Word for Mac 2015? Yes, the course is suitable for Mac users, but you need to be aware that three chapters deal with tools that do not run on a Mac (PerfectIt, ReferenceChecker and the Editor’s Toolkit). Therefore, to get full benefit of the course you will need access to Windows for those chapters, either on a separate PC or by running it on your Mac via something like Parallels. Please read the FAQ here: http://www.sfep.org.uk/about/faqs/training/#eww. We will have a screencast about this soon.